Ask anyone who grew up on the East Side during the “ice box” era about favorite pastimes and you’re likely to hear about begging (or stealing) slivers of ice from horse-drawn wagons delivering ice or milk. Local delivery businesses were just the “tip of the iceberg” of local industries built on ice. Ice was harvested out of Madison lakes commercially for local use as early as 1856 by Albert Warren, whose business was at the intersection of North Hamilton and North Pinckney Streets. In the 1870s Henry Allen and John Pyncheon cut and sold Lake Monona ice from their ice house on Rutledge Street. The Kurtz and Huegle Ice Co. was located on Lake Mendota in what is now Maple Bluff. That’s a lot of industry built on local ice! After the railroads came to Madison, the prospect of shipping ice to consumers in cities to the south became feasible. Also, the large breweries and meat packing plants both locally and in Chicago and Saint Louis created a demand for lake ice. 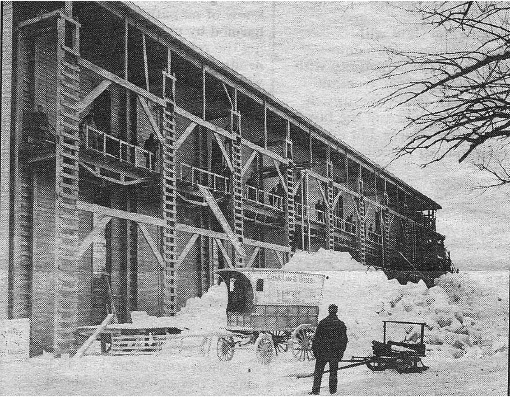 Several Illinois firms built ice harvesting businesses around the Madison lakes including Knickerbocker on Lake Wingra and Lake Monona, and the Jefferson Ice Co. and Esch Bros. and Rabe Ice Co. at the east end of Lake Monona at the foot of what used to be called “Ice House Hill” and is now called the Olbrich Sledding Hill. The local ice scene was dominated by Conklin & Sons, who had a very large ice house on Lake Mendota in what is now James Madison Park. For a long time the park was informally called Conklin Park. 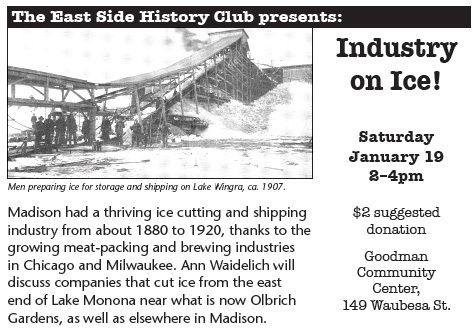 They delivered Madison lake ice to other cities well into the 1930s. Conklin Ice House located where James Madison Park is today. Cutting ice from Madison’s lakes was cold, hard labor that took place during a 4 to 6 week period in January & February. Unemployed construction laborers and farm hands worked 10 hour days for 50 cents a day. One house piece of ice (average 20 lbs) per day sold for 50 cents per week or $2 per month in 1882. 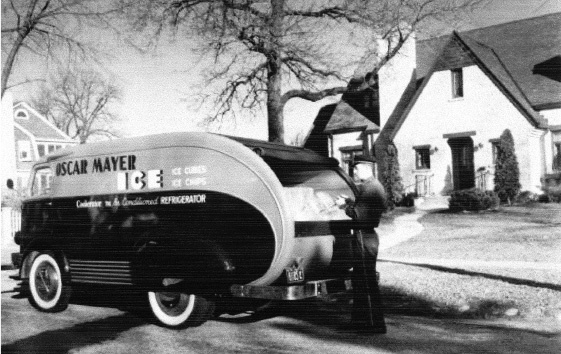 The Conklins sold their ice business to the Oscar Mayer company, which had been making and delivering “mechanical” ice since the 1920s. Oscar Mayer stopped making ice in 1968 and has relied on mechanical refrigeration since then. Ice boxes in private homes were popular from about the 1840s through the 1940s. Mechanical refrigerators were invented by GE in 1911. They gradually replaced ice boxes, which required the constant cost and delivery of ice (often inconsistent in quality), messy disposal of melted ice water, and making do without a “freezer” to keep food really cold. As with other modern appliances, the quality of refrigerators keep going up while the cost kept coming down and when the supply increased after World War II the end of the ice box era was at hand. 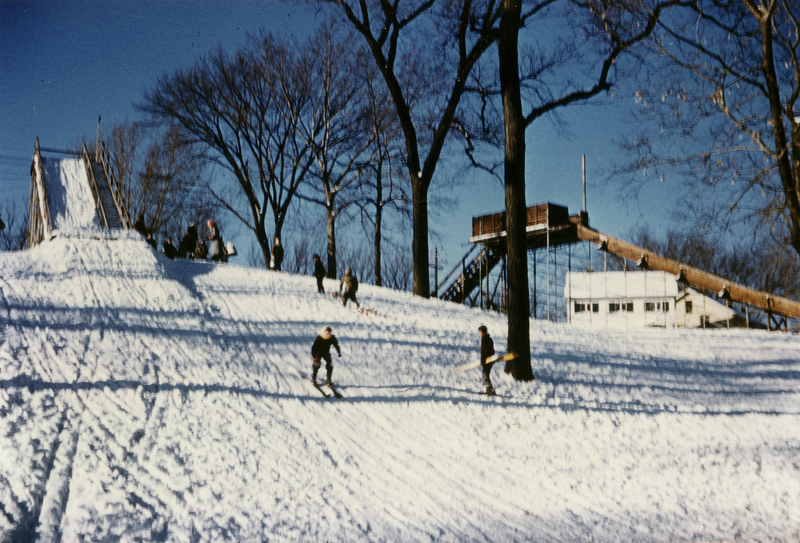 Thanks to Charles “Chuck” Steele, we now have this fantastic photo of the toboggan run and ski jump at “Ice House Hill” circa 1949. For those who missed growing up with memories of ice houses still in our collective past, “Ice House Hill” is the sledding hill at Olbrich Park. An ice house was located here until beet juice waste discharged into Lake Monona via Starkweather Creek from the U.S. Sugar Company factory made the ice unsaleable and the operation went out of business. The ice house was torn down; the building providing lodging for its workers was moved to the corner of Garrison and Buena Vista and turned into a private home; the hill became the site of this city-sponsored winter entertainment. According to Chuck Steele, city road-crew workers who would otherwise have no employment in winter were given jobs assembling and operating these recreational structures in city parks. Madison’s East Side was lucky to have such fun provided by the city. 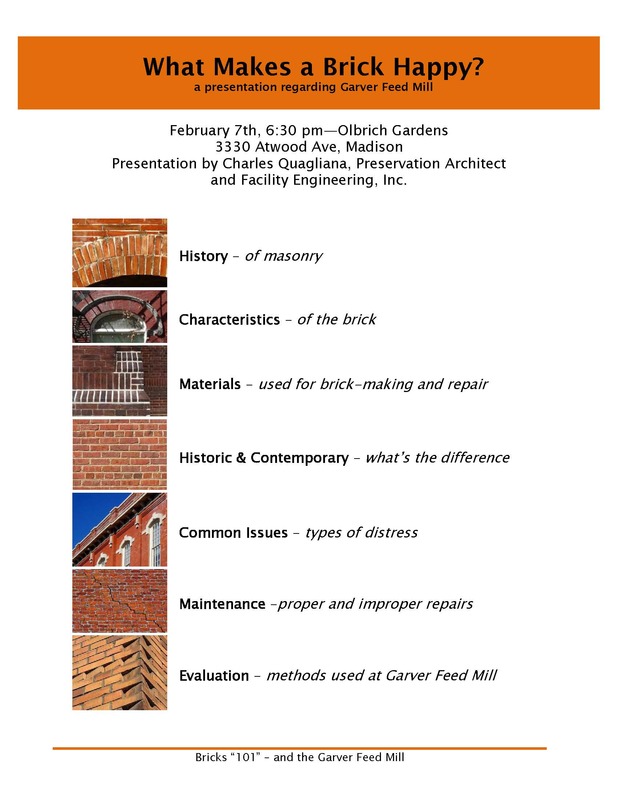 On February 7th, the public is invited to attend a community meeting to understand the Garver Feed Mill’s late 19th century/early 20th century masonry construction and the study methods being employed by Facility Engineering, Inc. to evaluate the condition of the bricks and the efforts required to stabilize the Mill. Charles Quagliana, of Preservation Architect and Facility Engineering, Inc., will speak on the history of masonry, the characteristics of the specific brick used to construct Garver Feed Mill, the materials used for brick-making and repair, and the difference between historic and contemporary bricks and masonry. In addition, types of distress and proper and improper brick repairs will be explained. The meeting will end with a review of the methods the consultants are going through to gather information about Garver Feed Mill’s condition. Charles Quagliana is a local preservation architect with more than 30 years of experience and expertise focused on rehabilitation and restoration work on significant buildings throughout Wisconsin. Facility Engineering provides professional, licensed, and insured analysis and design services to provide solutions to building envelope alteration and improvement needs and has a contract with the City of Madison to evaluate the Feed Mill. Please attend to show the City of Madison and the Olbrich Botanical Society how deeply we care about the preservation of this unique local landmark! If you are on the East Side History Club’s postal mailing list, look for your meeting announcement to come in a new cost-saving postcard format starting in January. If you’d like to save the Goodman Community Center even more money and receive your meeting announcements by email, please send your email address to: eshc@goodmancenter.org.